Although the presence of Hakuhei Sabi and the absence of Nanami upon the box which houses the shows four instalment amuses me somewhat. 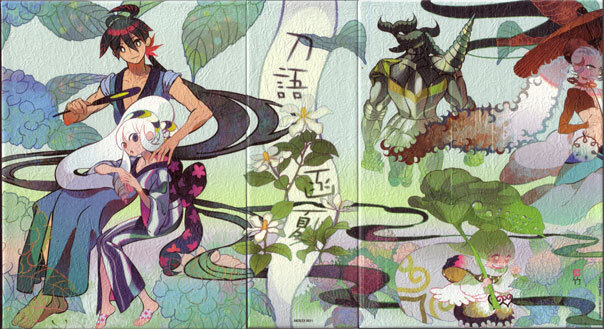 Six episodes in (still three episodes behind the rest of the universe) and I’m still enjoying Katanagatari immensely. The three-episode intervals between artboxes for the show seems to be a good enough period between episodes for there to be something to be worth saying about it. Although when I say “it”, my mind can’t really help but linger on the last phrase of the sixth episode. I mean, it’s not like many anime shows make the habit of non-nonchalantly stating that the shows hero would be killing his sister in the next episode before the ending credits had even rolled. I mean, it’s been patently obvious that the show has been headed in something approaching that direction ever since the forth episode happened, but the obviousness of a plot-twist has never particularly stopped anime from stretching out the reveal long past it’s become transparent to even the most dense of viewers. Perhaps it’s just that it’s originating from a novel written by someone who knows what he’s doing, but it’s showing a level of confidence in the attention span and intelligence of the audience which is all too rare. More than that, though, it’s displaying a level of confidence in it’s own writing that is perhaps even rarer. It harkens back to what they did with the shows fourth episode, where they eschewed the action-packed battle they’d both built up and had been advertising in the episode previews in favour of a rather slower paced affair featuring Nanami. As much as the initial revelation of what they were doing would have annoyed the viewer, they obviously had the confidence that what they had thrown together would still hold the audiences attention enough for them to continue. What they did here in the sixth episode was, arguably, even more interesting. It had none of the smoke and mirrors that’d be displayed in, say, My-HiMEs next episode previews, rather it played it’s hand face up for everyone to see. It’s almost as if The Sixth Sense had been proceeded by an announcement proclaiming that Bruce Willis was wearing a bald-cap for the whole movie (that was the twist, wasn’t it?). The framing running up to the episode sixes conclusion by no means made it assured that Nanami would actually be dying in episode seven – indeed, they laboured over the point that Shichika had managed to fell his last two opponents without having killed them, meaning that it was still somewhat feasible that she’d have made it out of the other side in something resembling one piece. By throwing that possibility immediately out of the window, it’s as if they’re making a statement that they don’t need to rely on cheap theatrics or shock developments to make the episode worthwhile. And that’s kind of neat, though I’ve yet to watch the episode in question in order to see if it proves true. 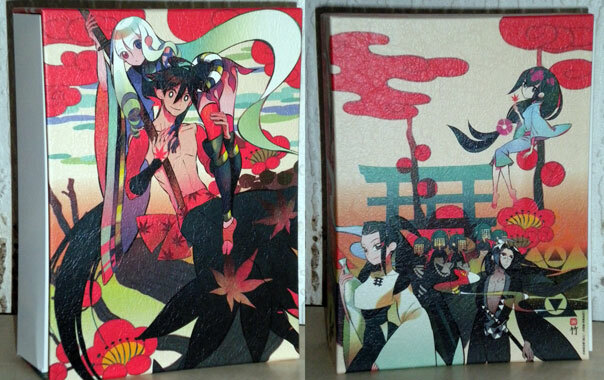 Katanagatari 3 has a pretty box. Yes it does – it’s a good piece of art, and the card with which it has been assembled has a nice texture to it. Makes a change from all those shiny chipboard boxes. Of course, it helps that I like the art from the show, though it’s tough for me to put my finger on an exact reason why. I think it’s mostly down to the animation staffs attempts to mimic the style of Takes character designs for the series – they’re deceptively complicated whilst looking tremendously clean. They animate well, though things like the absence of whites in some characters eyes does have the side effect of making it look at little lazy. And, yes, I realise I’m running about five months behind the rest of the internet here, but I’m behind on pretty much anything which isn’t Occult Academy. Truthfully, I wasn’t really sure how I’d like the show between mixed reactions to the early episodes and less-than-great reports about (admittedly the later volumes of) the novels, but I’ve taken pretty well to it now that I’ve broken down and started. I’ve pretty much come to the conclusion that I simply like meta-humour way more than most – my favourite episode of Macross Frontier would have to have been the one that essentially consisted of a barrage of series in-jokes and trolls. So, basically, when many are complaining about Katanagatari being far too talky, I’m perfectly happy to sit through half an episode of Togame complaining about the undeniably true fact that Shichika is far too dull to stand out against the flamboyant villains they find themselves up against. I kind of thought the setting may have prevented Nisioisin from being able to veer too far in that direction, but I’m happy to be proven wrong.